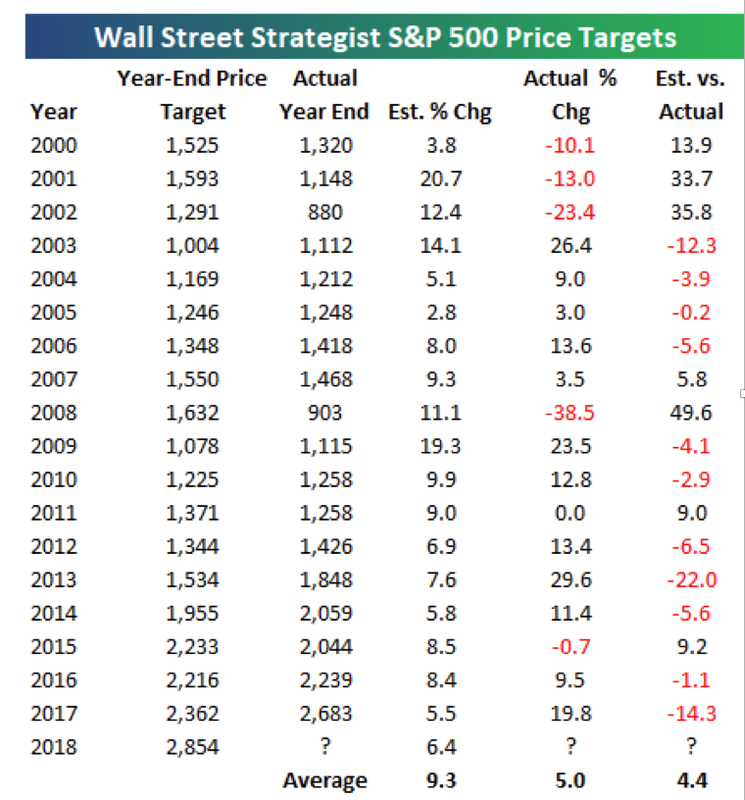 We aren’t even at the end of January and we have surpassed the average Wall Street analysts 2018 year-end target for the S&P 500! This my friends is called a MELT-UP. If this melt-up doesn’t make you a little nervous, you either have nerves of steel, aren’t paying attention, or are being a bit greedy. Either way, a little dose of paranoia seems like a reasonably prudent emotion at this time. From a purely technical perspective, this vertical move projects to 2950-3000 where it will hit the top part of the up-channel from 2009. This is a reasonable place the markets could struggle and some sideways consolidation would be ideal. Stocks can correct in time or in pull-backs. I think you know which is preferred if you’re long equities. Below is a great chart from Bespoke showing the average Wall Street analysts 2018 target. 2854 is the consensus target and we closed at 2872 today, Friday January 26, 2018. Oh my! The good news: Making money and generating attractive returns feels really good. The bad news: Vertical ascents tend to be a warning sign similar to the “last call for alcohol” warning. What happens to behavior when we believe the party is nearing its near-term zenith? People often party twice as hard, or at least that’s how I remember the story. I lived in San Francisco during the dot-com bubble boom and burst and it’s feeling very 1999 to me. Not 1999 in economic fundamentals or tech stock valuations but 1999 in vertical stock price movements. Please remember, my comments are NOT recommendations to sell all your stocks, they are simply cautionary signs that the current move is nearing an exhaustion point and needs a rest. There is clear retail trader euphoric sentiment but they are trend-followers so their behavior is not as interesting to me for contrarian signals. When talking to Financial Advisors, the only fear I see currently is FOMO, the fear of missing out. Their clients are locked in static balanced portfolio’s that are underweight growth and cyclical equities and overweight interest sensitive bonds and stocks at a time when rates have been rising. NOT an ideal combination from my perch. So there’s a decent chance we still have the last inning “chase” to keep up with Indices as they run higher. Then and only then will it really feel like a full 1999 experience. Here’s what the Leuthold Group has to say. Stocks are expensive and as long as sales and earnings are accelerating, they can and should get more expensive. Valuations are rarely a catalyst. Investor sentiment as measured by Leuthold highlights past periods when sentiment was this high. The forward average 12 months gain or loss was basically flat. Who knows what happens for the rest of 2018 but I continue to have a sneaking suspicion that this year’s gains will be achieved by July 4 as earnings expectations get more difficult to beat. Expensive stocks that do not meet expectations often set off a cycle of estimate reductions which is typically NOT bullish for stock prices. Netflix is the top digital entertainment Brand. Netlfix’s subscriber growth is truly breathtaking and the total addressable market opportunity around the globe is enormous. Yes,, the stock is expensive and they have massive content spending commitments but as long as subscriber growth continues, the market seems willing to look-through the current valuation. How dominant has Netflix become in media? Netflix now has more subscribers than all of the cable subscribers in the U.S. Now you see why Disney is buying 21th Century Fox assets for >~$54B? Catch-up can be a very expensive game! For now, party-on like it's 1999! Newer PostFrom FOMO to FUD & Back to FOMO?